Thousands came along to the Astwood Bank Carnival weekend and between them raised thousands of pounds that will be distributed amongst local charities and organisations later in the year. The weekend kicked off with a well-attended Race Night in the carnival tent where people were able to utilise a tote system to back their chosen horses over eight pre-recorded races, whilst being entertained by local group Wychwood. With an active bar and food snacks being provided by Little India the event got the weekend off to a cracking start. The light showers early on Saturday morning gave way to better conditions as hundreds of people made their way down to the carnival field to dress their floats. This year’s entrants included Astwood Bank First School, Church Hill Scout Group, Botany Bay Nurseries and Astwood Bank Cricket Club, all were decorated in this years theme of Time Travellers. 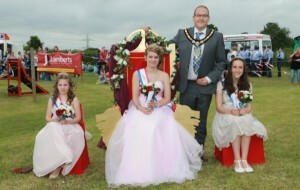 Mayor Joe Baker judged the winning floats as being the entre from Matchborough Scouts. The floats then left Edgioake Lane, along with the carnival royalty in their horse drawn carriage and numerous marching bands, to be joined at Astwood Bank First School by several walking groups including Astwood Smiles, Tiny Tribes, and Astwood Bank First School which was judged as the winning group. Along with several steam tractors the procession made it’s way around the streets filled with crowds having a great day out. 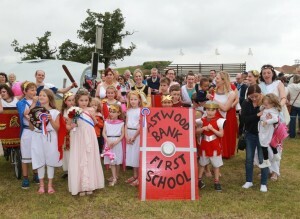 They all then returned to the carnival field where the overall procession winner was announced as Astwood Bank First School who received their trophy from Mayor Baker. 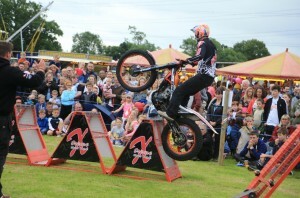 Also the arenas were displayed by Samba band and Royal Hussars as well as a breath-taking display of agility between the motorcycle and bike riders from The Xtreme Stunt Team who performed twice and thrilled the crowds. With a fun fair, numerous stalls and for the first time ever a dog show there was lots to keep people entertained and many ways in which to help raise funds through the carnival. In addition to all of this there was the crowning of the Carnival Royalty and the unveiling of the new Carnival logo design by Olivia Bevan, a Year 6 student from Ridgeway Academy. Ashley Hewitt, Astwood Bank Carnival Chairman said “I want to thank everyone for all of their hard work in pulling the event together, it is such a great day when we see everyone pulling together whilst having a great time, and in the process raising money for our local community”. Although the carnival team get a little time off, for the summer holidays they are already arranging a Quiz Night for September 23rd, and believe it or not this years Christmas Carols in the Park on December 17th. For any organisations, groups or charity that would like to apply for funding, funding application forms can be found over on the right of this page or here: Funding Application Form.